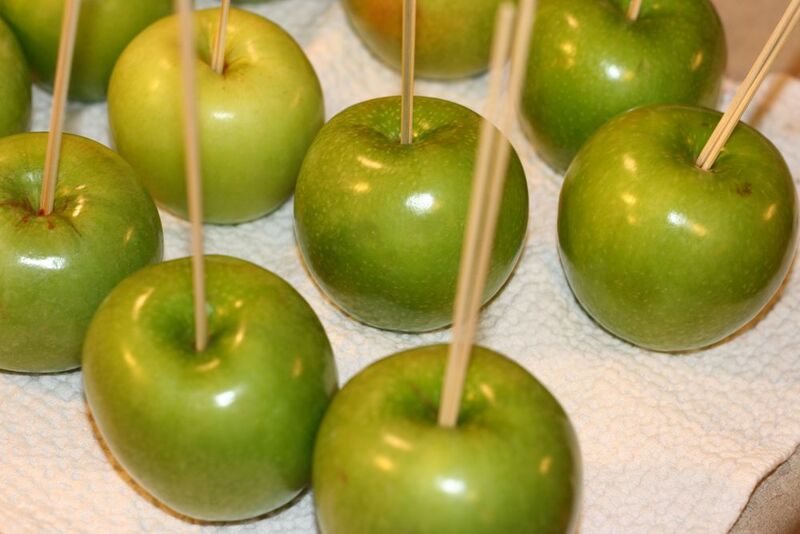 I had a load of green apples to get rid of and thought I would make some home made caramel apples. These were very creamy and the touch of vanilla make them special. I had various pecans, peanuts, chocolate jimmies and sugar pearls to dip the coated apples in. They were a hit! I made some turtles with the left over caramel. Yummy! Nuts, candies, cookies, etc. for dipping. Wash and completely dry the apples. Insert a stick or skewer into the stem end of each. Line a 9-by-9-inch or 7-by-11-inch baking pan with foil. Place the chopped nuts into the lined pan. Fit a heavy-bottomed saucepan with a candy thermometer. Over high heat, cook 3/4 cup of the cream, the corn syrup, butter, and sugar to 280 degrees F (firm ball); at this point the syrup will be golden. Remove from the heat and carefully swirl in the remaining 1/4 cup of cream and the vanilla. Use caution; this is very hot and it may splatter. While the caramel is hot, dip and turn the apples into the caramel to coat and let the excess drip off. Let the apples cool. Meanwhile, temper the chocolate. When the caramel has cooled, dipped the apples in the chocolate. Dip the bottoms into the chopped nuts and other toppings. Arrange the apples on a nonstick or waxed paper-lined cookie sheet and let cool.